This lesson shows the wonders we can do with graphs to make them show what we want people to see. It is a pretty elementary lesson that explains the importance of scales on a graph. I like the way the lesson gives examples of good scales and bad scales to show why the creators choice makes such a big difference in how the graph is read by others. As a student works his way through the assignment it becomes very clear how it is possible to manipulate data. For what it is worth, this lesson gets the job done. Don Cohen “The Mathman” guides students along a path to deeper understanding of patterns that lead to infinite series. during the Live event, we got to see the true joy that Don still gets from seeing his students succeed. Don has put together, with the help of one of his former students a wonderful “map” of calculus. The map has all sorts of examples of the work his students have done through the years. Some of the more notable work has been done by 2nd – 4th graders wherein they discovered infinite series while working on problems such as ” how can you divide 6 cookies among 7 people?” While he does not introduce any formal calculus terminology into his teaching of young children he is able to bring out the important concepts that they will need later in their schooling, all while helping to take away the “fear” of math. I found a lesson on Home School Math about Line Symmetry. The lesson was basically a “here it is” kind of lesson. The website gave a definition of a symmetry line and showed some examples. After giving the examples it asked the student to identify which of a set of shapes was symmetrical and to draw the line of symmetry. It did go a little deeper into the idea of a parallelogram and that fact that while it might look symmetrical when it actually is not. Finally, the lesson called for students to write all of the capital letters that have a line of symmetry. This lesson definitely falls on the low end of all of the spectrums we have been discussing in class. If we compare this with Bloom’s taxonomy it would have to be at the low (knowledge) end. Same with the Van Hiele Model, we are simply asking students to identify a property visually, so that would be a level 0 task. 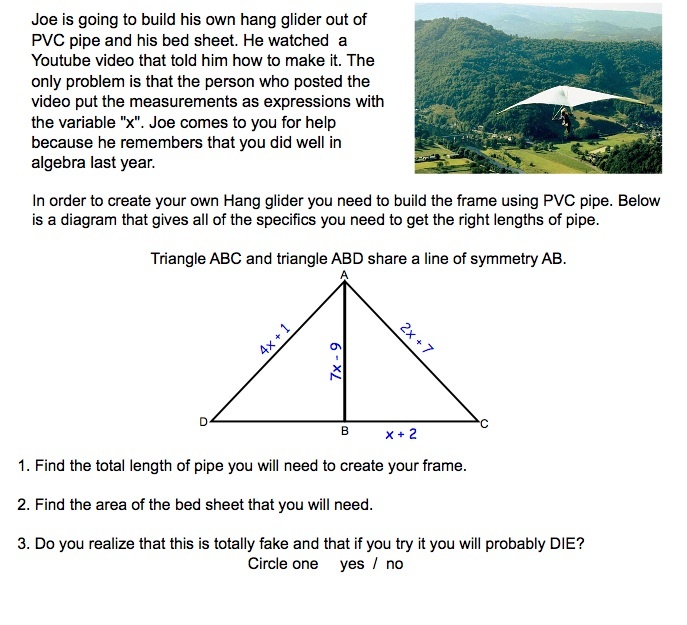 In terms of Problem solving and problem posing, their is very little depth to this lesson. The piece that best helped me to understand the Van Hiele Model was a Mindmap I found online. While it still left me with a few questions, I really liked the way it laid things out and categorized the information. There was a very clear distinction between the levels, properties, and phases of learning. I know this might not be exactly what was asked for in terms of a media piece, but it was by far the most helpful to me. Now, to address the questions in the task grid. The levels apply to individual students as a way of assessing where they stand in the continuum of understanding geometry. It also applies to the type of tasks being presented to the students. A student at a certain level in the Van Hiele model will be unable to answer a question based in a higher level of the Model. I think to try and apply the Model to a group of students would be irresponsible because each student will be in a different place in their understanding of each level. Because of the linear way the Van Hiele model works a person can not be on two different levels at the same time. Since each level builds on the previous one, there is a need for a complete understanding of a level to move on and be successful at the next. I created a screencast to illustrate the applet I created in Geogebra for helping students see the affects that changing the slope and y-intercept have on a line. The screencast can be found here, and if you want to play with the applet yourself, it can be found here. I tried to upload the applet to the applet collection page and it gave me some trouble at first. I messed around with the class wiki a little bit ( I hope that is ok) and I put a link to the Applet Collection page in the navigation bar on the left side of the screen. I was then able to upload the applet. The live event I attended was Project Euclid scholarly library. Project Euclid is an online resource started up by the Cornell University Library (they now have the help of Duke University Press) that is designed to give independent and society journals a low cost option for publishing. Their goal is to have a forum of full text, open archives, that allow smaller journals to operate with low overhead cost so that they will be able to continue publishing scholarly communication in the field of theoretical and applied mathematics and statistics. During the discussion I learned that Project Euclid is really trying to “connect users and creators in a way that helps people who are at the ground level, who don’t have the funding to publish on their own.” The project has great intentions, in fact they already have over a million pages online, but they could always use more help. THey need people to spread the word about what they are trying to do. Not only do they have articles and journals online but they also have historic monographs that they have been carefully scanning and uploading to the site. They currently have about eighty monographs that were deteriorating scanned in and are planning on adding almost 500 more. Some of these monographs date back to the 1840’s and 1850’s. To reiterate, a lot of the content is open to everybody and they are working to expand their offerings all the time.